A Council on American-Islamic Relations (CAIR) spokesman demanded Friday that the Investigative Project on Terrorism (IPT) either back up its claim that CAIR officials have repeatedly described the war on terrorism as a war on Islam or retract it. Had CAIR National Spokesman Ibrahim Hooper clicked on a hyperlink included in the original story, he would have found eight pages of previously published examples on that very point. It was Hooper's response to the six examples provided that proved most mystifying. For example, CAIR Executive Director Nihad Awad told CNN in 2007 that "I think there is a growing perception among Muslims worldwide, specifically in Iraq, in majority Muslim countries, that the war on terrorism is in fact, a war on Islam." Hooper wrote back with a one-word retort: "perception." Such parsing might be effective had it been the only time CAIR officials hammered the message, or, had any of them followed the statement by contesting that "perception." But that never happened. The repetition of the "perception" is significant because many in law enforcement believe the "war on Islam" narrative is among the most significant messages in radicalizing young Muslims. Hooper never explains why CAIR officials would repeatedly invoke that perception if they did not wish to perpetuate it. For each example the IPT cited, he seemed to indicate that they didn't mean what they said. See the exchange here. Hooper's responses come between the examples. "If American Muslims allow their charities and institutions to be destroyed without defending them with their words, actions and funds," wrote then-CAIR Western Region Communications Director Riad Abdelkarim in 2002, "those organizations already targeted will not be the only American Muslim institutions eliminated in this war against American Muslims." "American Muslims, not Islam" wrote Hooper in response underneath the quote. It's not clear how saying the United States is at war with Muslim Americans helps his argument. Abdelkarim also once wrote the following, which was provided to Hooper. "On Tuesday 4 December 2001, the US government effectively declared war on Islam and Muslims in America." Similarly, Hooper wrote the word "impression" after an example of a 2001 joint statement by CAIR and other groups which claimed that the U.S.'s decision to freeze the assets of the Holy Land Foundation (HLF), "is an unjust and counterproductive move that can only damage America's credibility with Muslims in this country and around the world and could create the impression that there has been a shift from war on terrorism to an attack on Islam." Not only have CAIR officials refused to challenge the "perception," but Awad has said "Our administration has the burden of proving otherwise." That's what he told Islam Online in 2002 during a trip to Saudi Arabia. While he was there, federal agents raided offices and homes related to Northern Virginia charities as part of a terror financing investigation. The Saudis, Islam Online reported, reacted to the raids by saying "this is a war against Islam and Muslims." Despite the many examples provided to him, Hooper concluded, "Still no CAIR statement to back up you[sic] false claim." Since 2007, CAIR seems to have backed off the "war on Islam" talking point. But it continues to cast government actions as unduly threatening toward Muslims even if officials avoid provocative phrases like "war on Islam." In April, CAIR-NY board member and attorney Lamis Deek told an audience at a "Know Your Rights" seminar that the FBI is out to arrest and lock up Muslims even if agents have to lie and cheat to accomplish their objective. "We're in an age where we are in fact all on the radar," she said referring to Muslims, "we are in fact most of us under investigation." When it comes to relations with the government, CAIR officials routinely misrepresent the facts. Christina Abraham, an attorney with CAIR's Chicago office, claimed that a judge's ruling challenging the group's inclusion on a list of co-conspirators in a massive Hamas financing case was "settled … in CAIR's favor." The judge did rule that the list should not have been made public, but ruled that CAIR belonged on it because of "ample evidence" linking it to Hamas. CAIR's Michigan office, led by Dawud Walid, spent more than a year trying to drum up animosity toward the FBI by trying to cast the shooting death of a Detroit imam as an excessive use of force. Though two separate government reviews found that Imam Luqman Abdullah had concealed a weapon and opened fire as agents moved in to arrest him, Walid questioned whether Abdullah even had a gun and wondered "Is this the kind of excessive force that we black Americans are all too familiar with?" Those reviews found agents acted appropriately in returning fire after Abdullah, who had a history of making threatening statements toward law enforcement, refused to surrender peacefully, and fired first. Meanwhile, Hooper was less accommodating in response to challenges about his own organization. We asked if he could produce copies of CAIR's annual tax forms, known as 990s, after requests by Politico and other media outlets were not fulfilled. As the IPT reported first, an IRS list published last month included the CAIR Foundation and CAIR-National among 275,000 organizations which have lost their tax exempt status after failing to file tax forms for three straight years. As a result, donations made to CAIR are no longer tax deductible unless CAIR is able to successfully file for a retroactive reinstatement. But it took media exposure of that fact for CAIR to finally remove a statement from its website claiming that donations remained tax-deductible. 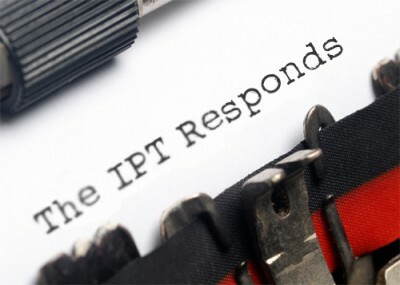 Hooper simply ignored the IPT's question. We answered his directly, even if he didn't agree with it. For years, CAIR officials repeated the concern that the war on terrorism was a war on Islam and Muslims. Whether they were merely invoking a pre-existing perception is irrelevant since the examples we cited include no attempt to refute the idea. We stand by our original claim and our response. CAIR is following the MB memorandum to the letter: Here is just a part of that manifesto written in 1991. Here are just a few examples (it is 18 pages) of the contents, but I think you can get the picture. society and has firmly-established "organizations" on which the Islamic structure is built and with which the testimony of civilization is achieved, the Movement must plan and struggle to obtain "the keys" and the tools of this process in carry out this grand mission as a "Civilization Jihadist" responsibility which lies on the shoulders of Muslims and - on top of them - the Muslim Brotherhood in this country." - An Islamic Central bank. - Technical organizations and vocational training. - A council for education and scientific research. - Centers to train teachers. - Scientific societies in schools. - An office for academic guidance. - A body for authorship and Islamic curriculam.. . . and things like that. - A center for studies and research. - An organization for Islamic thought and culture. - A publication, translation and distribution house for Islamic books. - The project to translate the Noble Quran, the Noble Sayings .... and things like that. - A Central Jurisprudence Council. - A Central Islamic Court. - The Islamic Foundation for Defense of Muslims' Rights ... and things like that. Cair is coming to Tampa? This question is directed to Norman N. Gross PhD, You said that CAIR is moving to TAMPA? Really? I have not heard any news about that. I have heard that there is a new executive officer coming to TAMPA straight out of college from Buffalo NY. Hassan Shibley, I believe, is his name. To my knowledge, CAIR Southeast branch headquarters is in Tampa. They are here and have been here for many years. CAIR and Muslim activists have also slipped their jihadists supporting friends into some of the Universities in Tampa area also. Sami Al Arian was a USF professor before he was convicted of supporting the Palestinian Jihad group. I'm sure he's been replaced with somoene just as awful. CAIR is moving to Tampa. What questions should be asked? That Herr Hooper even responded with terse one-word answers was something of a major victory of IPT. As you know, the most direct, most concise questions of Mr Hooper regarding his group's activities and goals, particularly as they apply to intelligence gathering and subversion, garner nothing but talking points, obtuse denials and non-sequitir distractions.